I believe health has many meanings and we all have a different definition of what being healthy is. At every stage of my journey I felt I was healthier than before. I believe that being healthy is a cycle of different parts of one’s lifestyle. I believe it’s not just about food and exercise, but also about state of mind and the environment we live in. However, food and exercise have a huge impact on the other elements of one’s lifestyle. Therefore, I will start with answering one of the most common questions I get asked, what are some of the things a person can begin to do to change their lifestyle to a healthier one? I’ve summarized what I believe are the top 10 first steps to start transitioning. I read and did tons of research when I started my journey. I began by eliminating the following from my diet and lifestyle. Once again, reading labels is very important. Even though some packaged foods may say “No Trans Fats,” they may have hydrogenated oils. They are not the same, and I will let Dr. Weil explain that in his article. Have you ever wondered why fast food is so inexpensive? Why junk food is so addicting? Well if you read the labels you can see the answers to those questions. Most contain trans fats, hydrogenated oil, and high fructose corn syrup. If you eat it everyday, start small by cutting any fast and junk food two days a week the first week, three days the next week and so forth. Why is TV bad for you? Well not all shows are bad, but the more time we spend on the couch watching TV, the more time we loose on other activities that can contribute to a healthier lifestyle. I would suggest cutting down the amount of time spent on the couch watching TV and playing games to 30 to 45 minutes a day and begin replacing that with other activities. This is one addiction I’m still battling. So we remove bad things and replace them with good things. Here is a list of things one can begin to add to help the transition. Replace white rice, white bread, white pasta, with whole grains and foods such as brown rice, whole wheat breads and pasta. I developed a love for Soba noodles, rice noodles and past as well as long brown rice and whole grains. Most grocery stores carry these nowadays and have reasonable prices. Probably one of the most important things to add to one’s new healthier lifestyle. At the beginning I would recommend to start with frozen vegetables that way you can experiment and find what you like and then replace them with fresh vegetables. Many times, if one is not used to eating certain veggies, buying fresh and not using them in time can be discouraging. Replace the afternoon snack-machine-candy-bar for a fruit or the morning on-the-go frozen-breakfast for a fresh fruit smoothie. You will be adding tons of vitamins to your diet without having to spend money on additional vitamins. Drinking water is very important to help the body eliminate toxins. Start small if you are not used to drinking water. Replace two of your preferred drinks with a bottle of water everyday until you are able to drink water without thinking. I prefer Essentia water because it has the highest pH available in bottled water, but I also rather carry my reusable bottle and fill it up with water from my own filtered kitchen sink. 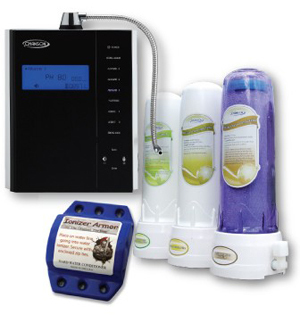 I later bought a water Ionizer which I prefer. So even though I’m a TV addict and can spend up to 6 hours straight in front of the TV without even blinking, I feel much better when I go outside and spend time with nature. I don’t pay for being outdoors; I find activities or recreational sites that are free. For example, going to the beach, taking a walk in a park, hiking in local parks, going for a car ride, riding a bicycle around the block, or simply sitting in my backyard reading. Even if you live in a city, there are parks and sites. If not, use your balcony or roof to spend time outside your living area away from the TV. I know… I know… this is the hardest thing to do! I love and hate exercise. I love it when I’m doing it, and I hate it before I begin. I can come up with all sorts of excuses to getting out of exercising. So I’ve decided now that as creative as I get with the excuses, I can be creative on how I get my 30 minutes of exercise a week. I recently started going to the beach and swimming in the ocean three times a week after work and swimming for 30 to 45 minutes a day. I also have a rebounder that I moved near my computer and started to jump for 15 minutes before I begin to check my email or go on Facebook, etc. While Denis works on the computer I may do some yoga poses while I wait for the computer or lift some weights. I belonged to a gym and loved it, but we had to cut out our budget for the gym to save money. Now, I look for ways to exercise for free. Every person is different and I suggest beginning very small. Pick one thing from each list to begin with and see how it works for you. It also helps to have the support of others or people who can do it with you. I’ve read many books and done research before I started. I also do a general check up every year and get my blood work done too. It’s important to have the help of a doctor before making any changes to your lifestyle. For more books on health, food, and exercise, visit the Books Tab.